The snow is starting to melt, the weather is getting nicer and the water temperatures are rising, time to go fishing again after the winter layoff. 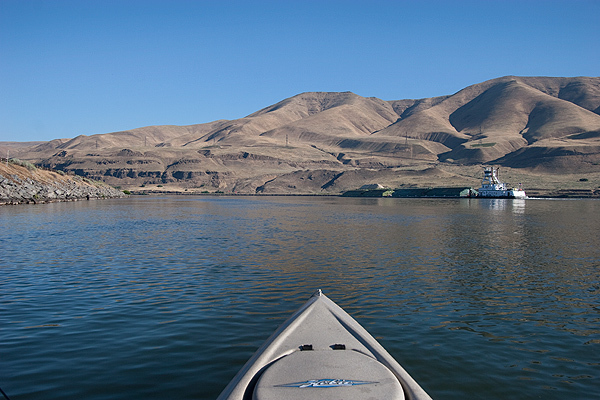 Got the kayak and fishing gear all squared away and headed down to the Columbia River for some smallmouth bass fishing. 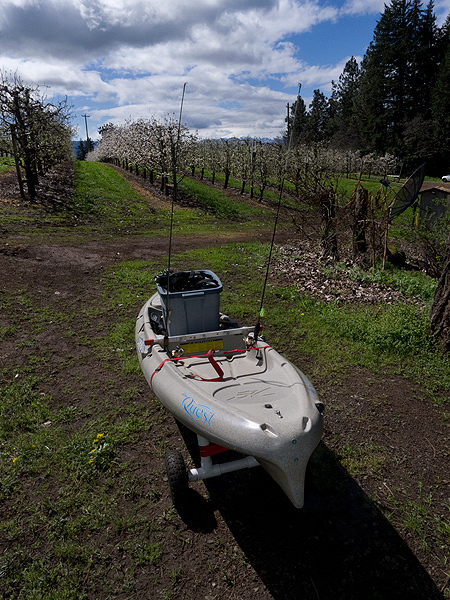 I had to use the kayak cart to get down to my truck from my house because the "driveway" is still too muddy to drive up. It rains a little in this part of the country you know. The fish weren't biting, but they will be soon. Great to be back on the water again. The weather is getting a lot nicer, this is a great time of the year. 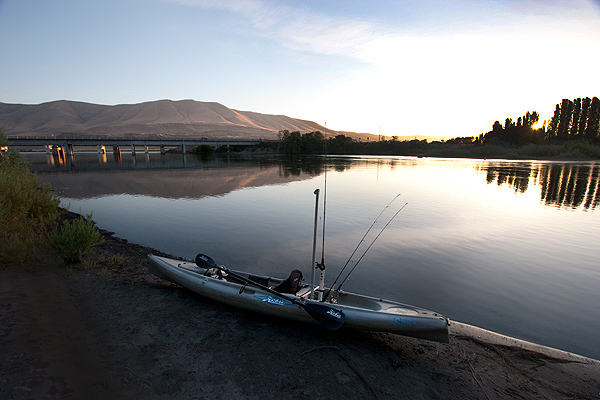 Trout season opens in Washington state tomorrow and the water in the Columbia River is starting to warm up. The water in the main channel is still pretty cold, after all, the snow is melting on mountains that are 40 miles away, but there are some back waters and eddies where the water is a little warmer. 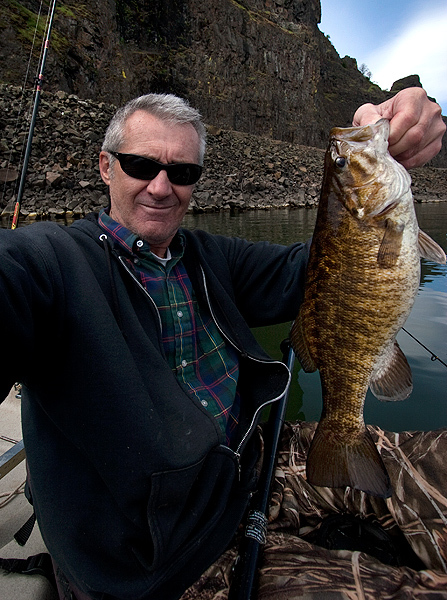 The smallmouth bass season won't really get going for a week or two, but this is the time of year when you catch the big ones. The water is still too cold for the smaller fish, only the bigger fish are moving around looking for food and spawning nests. You don't catch many fish in the late spring/early summer, but they are usually pretty big. Only gets better from here. The weather has been a little hit and miss with a few really nice days mixed in with a few days where it's too windy for safe kayaking, but the fishing is still really good. 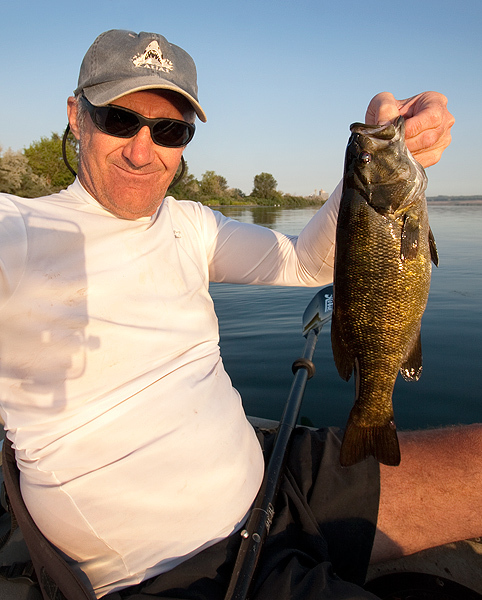 The smallmouth bass season is entering the best time of the year, there are a lot of big, hungry smallmouth bass around. 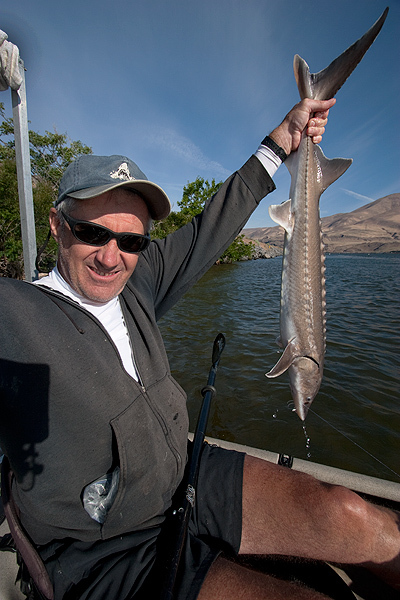 There are a lot of fish in the Columbia River, sometimes you get something you're not fishing for; like this small white sturgeon. 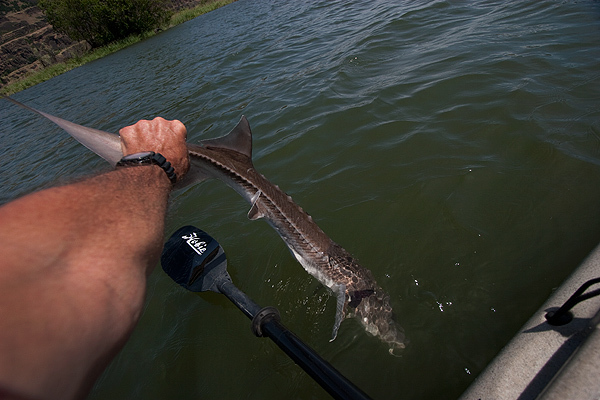 A little bit of a tussle getting it to the kayak, getting it unhooked and back in the water on a 10 lb. test rig. Hoping the weather starts cooperating because the fish are biting; time's a wastin'. Last edited by ronbo613 on Thu Feb 05, 2015 12:35 pm, edited 1 time in total. 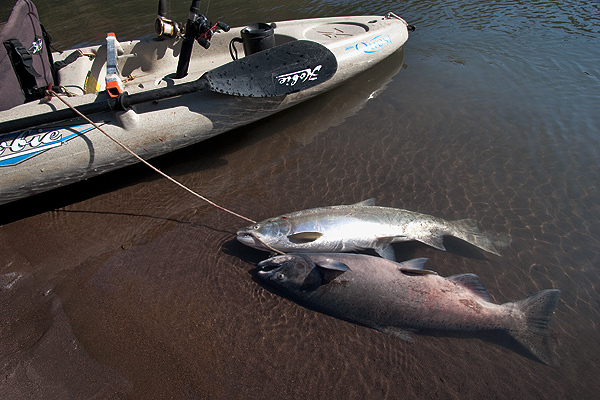 The Columbia River can be a dangerous place, plenty of hazards for kayak fishermen. There is a better quality MP4 video HERE. Stay alert and you won't get hurt. Last edited by ronbo613 on Thu Feb 05, 2015 12:38 pm, edited 1 time in total. Summer is here in the PacNW and it has been hot, very hot. Doesn't happen that much around here, believe me. For the most part, the summer fishing action has been pretty hot as well, we go after smallmouth bass most of the time in the spring and summer with a trout fishing trip once and a while, but wild smallmouth bass are more fun than hatchery trout. You may think the PacNW is all forests with big pine trees, but there is a significant part of it that could be described almost as "high desert". It's brown and dry much of the year. 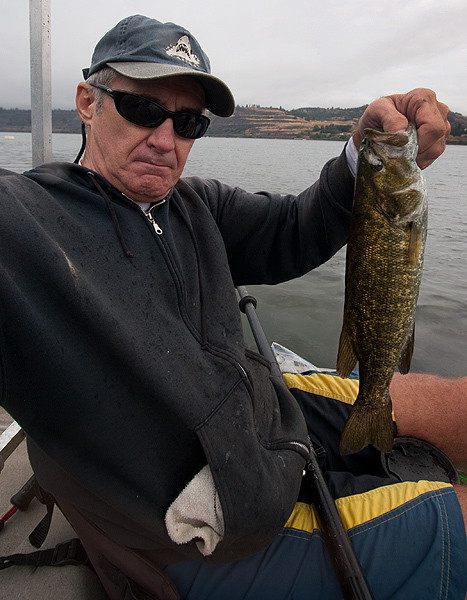 Usually, as summer heats up, the smaller bass start to bite but there are still plenty of big ones out there as well. 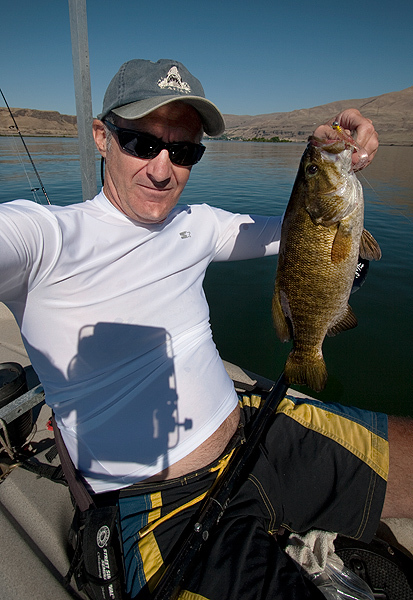 The smallmouth bass in the photo below may be the biggest bass I've ever pulled out of the Columbia River. 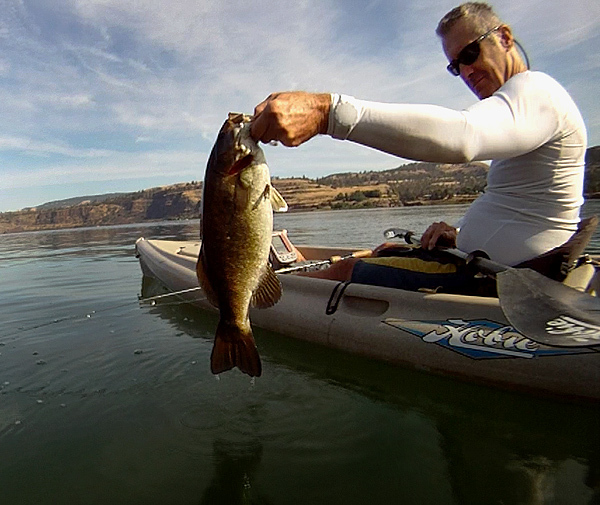 It's been windy lately here in the Columbia River Gorge, so the kayak fishing on the Columbia River has been a little slow. 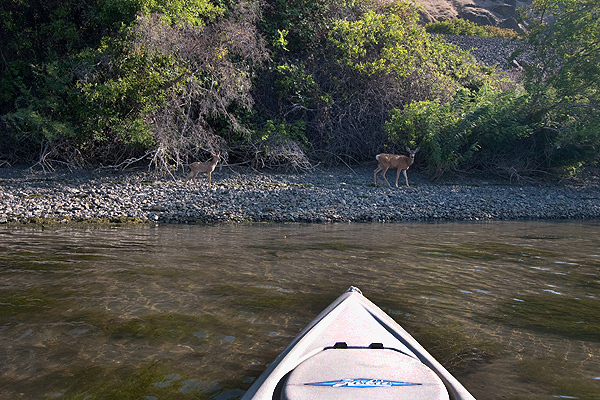 We managed to get out yesterday for a little smallmouth bass fishing when we spotted some of the local wildlife. They didn't seem too worried about a guy in a kayak so I managed to get pretty close to them and take this photo. The leaves are turning colors, it's getting colder and the water temperature in the Columbia River has dropped signaling the end of the smallmouth bass season here in the Pacific NW. You can probably catch smallies all year if you wanted, but with the nasty winter weather, it's not worth the effort. It's been a great year for smallmouth bass fishing from the kayak, we caught a lot of bass and a number of 20" plus trophy fish. We've been fishing for salmon the past couple weeks, you can check out the progress on my blog and I'll be posting salmon fishing photos here shortly. 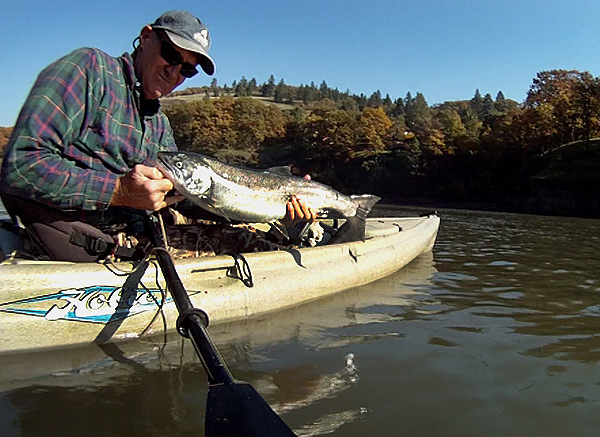 Unfortunately, the 2013 kayak fishing season has come to an end here in this part of the Pacific Northwest. There's not much to fish for and it's 20°F and snowing, that's a sign from Mother Nature to try something else for a couple months. 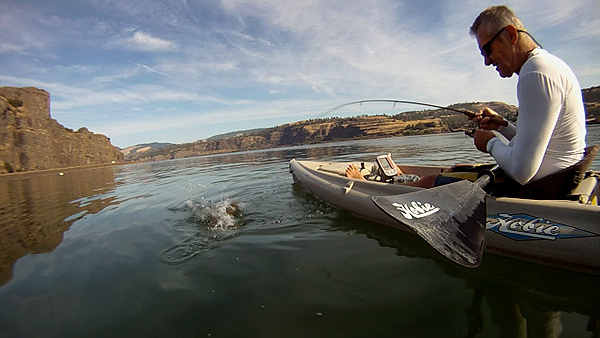 It's been a great kayak fishing season, we caught a lot of big smallmouth bass, a bunch of rainbow, brown and cutthroat trout, a few sturgeon here and there and what was probably the highlight of the year; a record fall salmon run where we managed to catch a lot of big Chinook and Coho salmon. The cold weather means more time indoors, so I've been able to catch up on posting kayak fishing photos to my website. I take a lot of kayak fishing photos and videos during the fishing season but it's tough to find time to edit everything and get it on the website because when the weather is nice around here, you take advantage of it and don't sit in front of the computer. Click HERE to check out the kayak fishing photos, I'm working on the kayak fishing videos and will have those up shortly. Thanks. This is one of the last areas of America where you can still experience the great outdoors. The fishing is pretty good, too. Time to get the 2014 fishing season started! 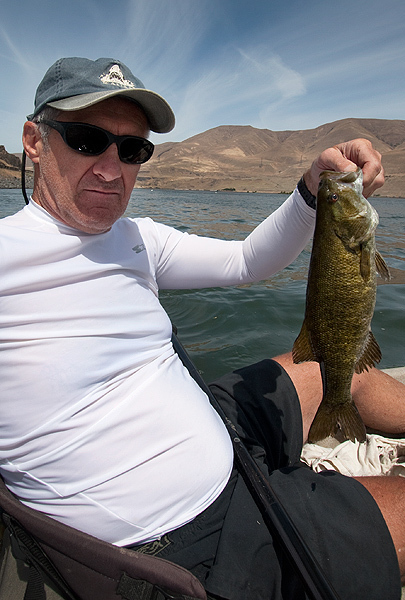 The water temperature in the Columbia River is getting warmer and it looks like the smallmouth bass fishing is picking up. They will be spawning soon so this is a good time of year to go after the big bass. The PacNW weather can be very unpredictable this time of year with 20-30mph wind not uncommon. It can go from dead glass to victory at sea in fifteen minutes. 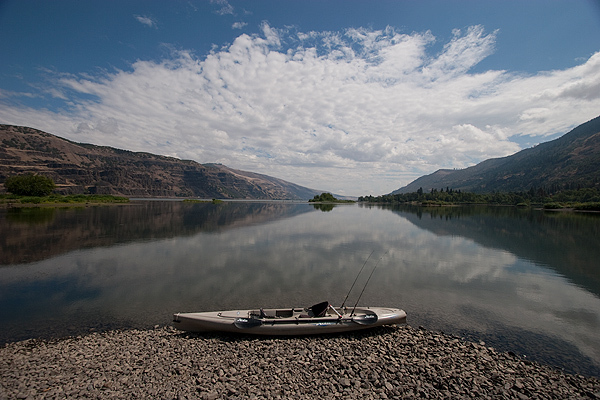 The John Day River in Oregon is one of the best smallmouth bass fisheries in the United States. 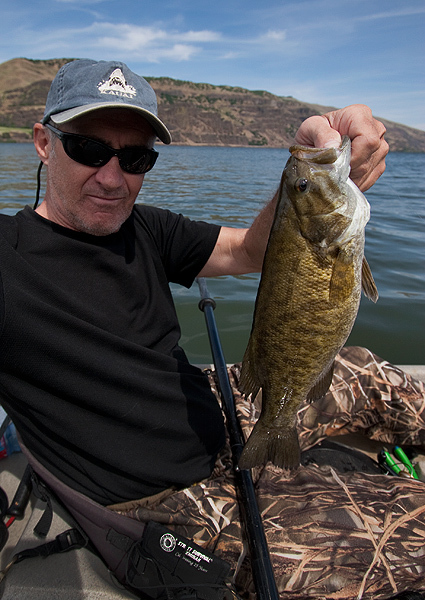 We went fishing there yesterday and I caught over a hundred smallmouth bass, not really unusual for the John Day. When most people think of Oregon and the Pacific Northwest, they visualize trees, forests, snowcapped mountains and rushing rivers. Those things are here, for sure, but there is a big chunk of eastern Oregon and Washington that is very hot and dry(in the summer), this is the part of the Pac NW where you find the John Day River. As is the case in much of the PacNW, there is a lot of wildlife running around. 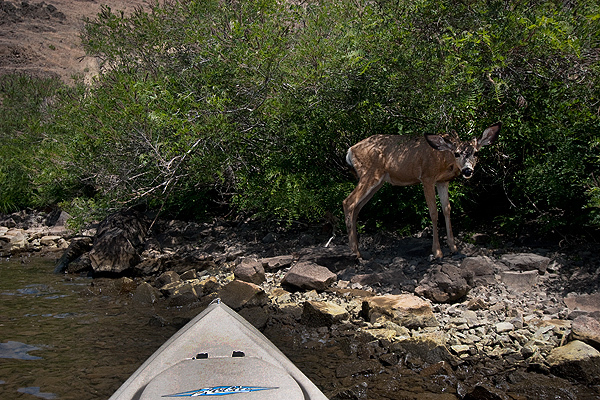 Instead of more pictures of me holding up fish, here's a photo of a wild mule deer who let me get within a few feet of him in my kayak. 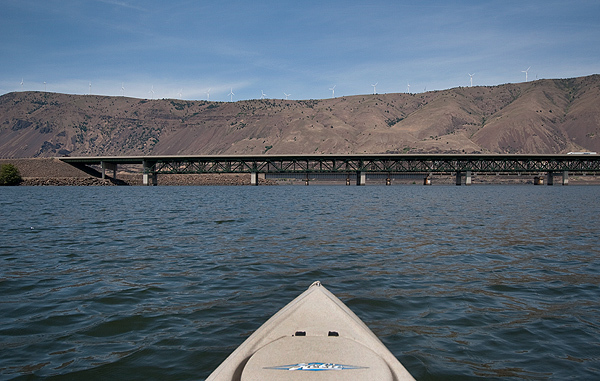 The long days of summer have arrived and it's been mostly sunny and, unfortunately for kayak fishermen, very windy here in the Columbia River Gorge. When the wind dies down you have to get out there and do some fishing. 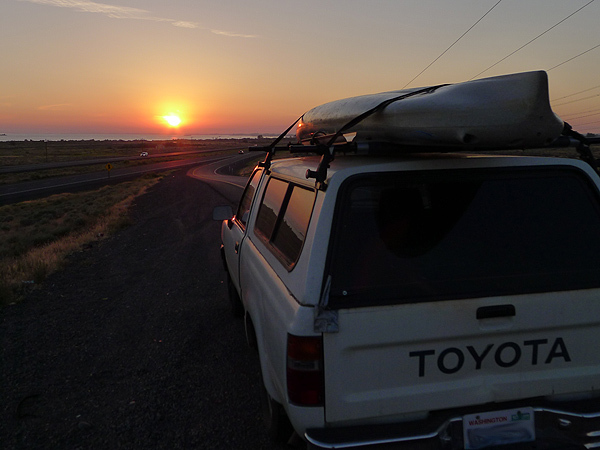 We decided to run away from the Gorge winds and head east to the Deschutes River. 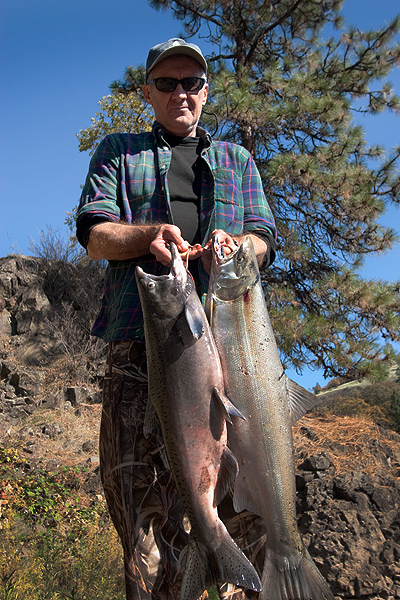 The Deschutes rivermouth is a great fishing spot. You can catch smallmouth bass and walleye in the summer and salmon in the fall and spring. We got an early start because we only had a couple days of relatively calm wind and wanted to get as much fishing time as we could. Getting an early start also beats the summertime weekend crowds. 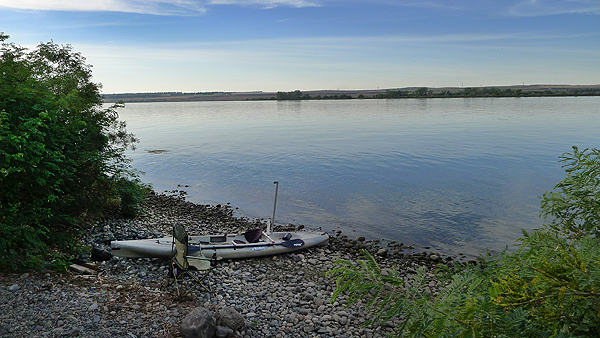 We paddled around Miller Island, a large island in the Columbia River, where the smallmouth bass and salmon fishing is good. A long paddle with tricky river currents and eddies. We tried drift fishing for walleye, but the current was pretty strong and there was a lot of weeds and junk in the water that made this kind of fishing pretty tough. We weren't having any luck with the walleyes so we went after smallmouth bass and did a little better. I also hooked up a small sturgeon that put up quite a fight on the light tackle I was using. There are a lot of regulations with sturgeon retention, I usually release them because I don't target them and I'm not familiar with the rules. For where I was fishing, I think sturgeon need to be 43" long to keep them, I didn't have a ruler, but I think this one would have been a little short. 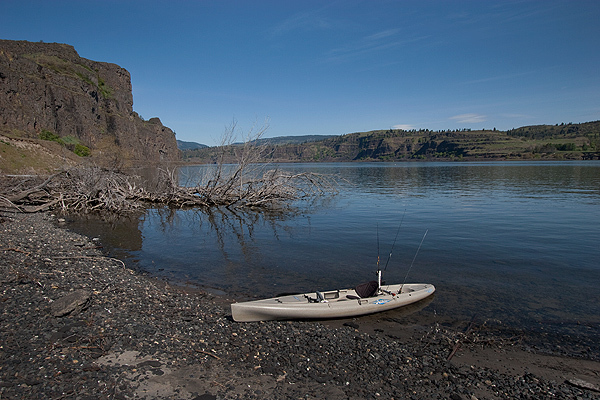 One of the great things about kayak fishing here in the PacNW is that there are a lot of places that you can go where the fishing is good and there are no people. I know some kayak fishermen like to spend a day kayak fishing in a kayak fishing contest with seventy five other kayakers, if that's what you like to do, that's fine, but we would rather scour the maps and find places where we may be the first kayak fishermen to ever wet a line. The PacNW has a nearly unlimited number of beautiful bodies of water and "off the beaten path" spots that can give you a real sense of discovery and adventure that you won't find in a crowded parking lot. 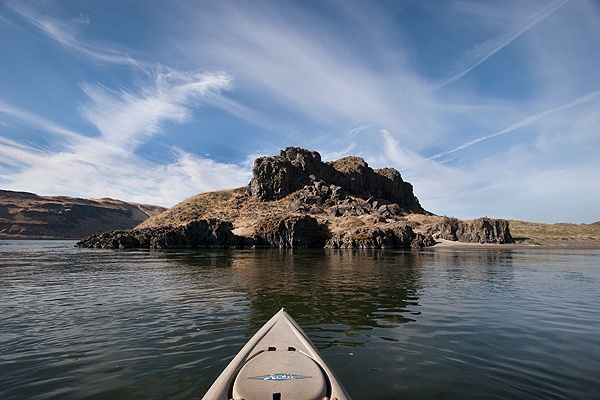 We headed out to eastern Oregon last week to escape the non-stop Columbia Gorge wind and to look for new places to go kayak fishing and we found them. Primitive camping, free, no daily fees or permits; just you, what you brought with you and the wide open Pacific Northwest. You have to be prepared to take care of yourself in many of these areas; even if you can get a cell phone signal, if you get in a jam, help is often a long way off. Out here, if you get yourself into trouble, you better be sure you can get yourself out of it unassisted. Being out in the middle of nowhere does have it's benefits. Almost forgot about the fishing! 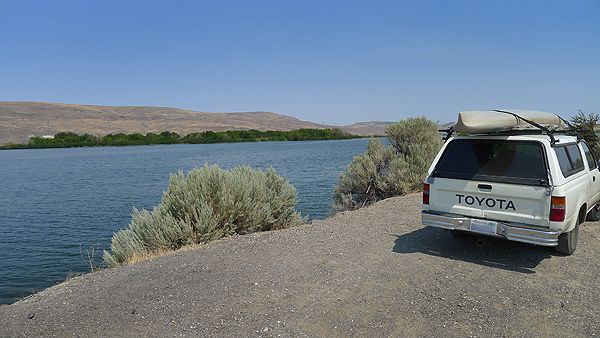 We were fishing mainly on the eastern Columbia River up and around where it meets the Snake River. There is all kind of great fishing around here for all kinds of fish. On this trip we were looking for smallmouth bass, but could have easily caught salmon, sturgeon, trout, largemouth bass and a few other species that are found in the area's rivers, streams and lakes. We had great days of bass fishing, saw other fishermen catch salmon and one guy who hooked up a monster sturgeon on his 20lb. test salmon rig, all in the same spot. We did a lot of fishing, but we also did a lot of scouting around for kayak fishing/camping spots for the upcoming salmon season. 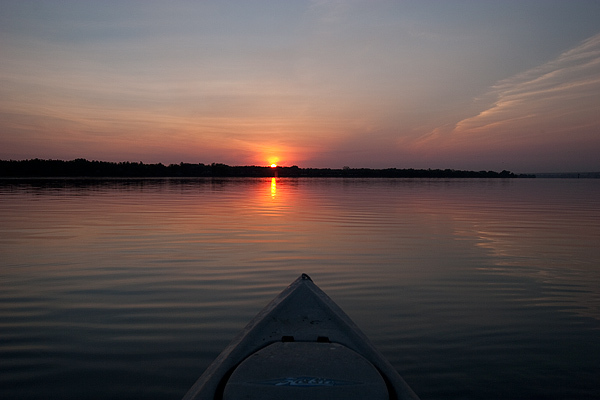 We found this spot that isn't even on most maps that is a kayak fisherman's dream. Right on the river with a wind protected slough and close to excellent salmon fishing. We'll be headed back there as soon as we get the chance.